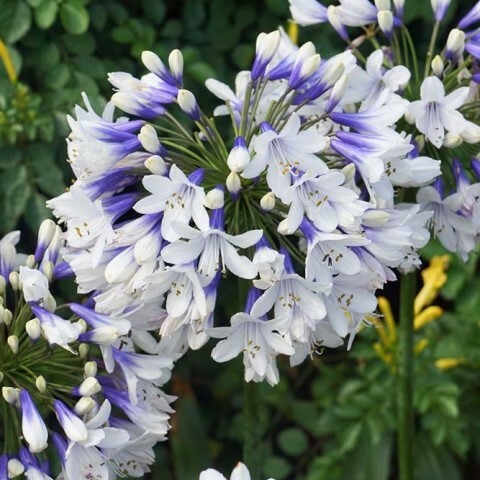 Hitting the European market by storm is the unmistakable Agapanthus Twister. Arrive in summer above herbaceous strap-shaped leaves are the giant spherical globes of ink-blue and white. These giant bare roots will produce up to 3 flowers in the first year. Suppied as giant bare-root plants. Flowering in gardens now and making the perfect contrasting pot centre for your Agapanthus twister is this neat award-winning Forsythia. Growing to only 1m tall it will stay compact enough for the smallest gardens. Soil - Fertile and well drained.If heavy soil, mix in grit. Additional Information - They prefer to have restricted roots. Apply a balanced liquid fertilizer weekly in the weeks before flowering. Do not overfeed as they will stop flowering and produce lush foliage. Provide winter mulch in colder areas. When planting in heavy soils or pots place grit/crockery at the bottom of the hole to aid drainage. Hardy perennial.